Any new material offers both opportunities and risks to industrial designers and architects. There may be significant opportunities to enjoy radically new or improved technical or aesthetic behavior. The risks lie in incomplete understanding and characterization of the functional properties as well as the lack of previous design or manufacturing history. In architecture, for example, structures can be exceedingly complex in form, and the loads to be applied to the structure are equally complex. Hence, it can be difficult to analyze the loading on a given proposed structure and the resulting stress distribution within it. As a result, material elements and structures tend to be as simple and discrete as possible. Conventional design paradigms are constantly re-worked even though they may not be optimal, but simply because it is more difficult to create and test new alternatives that will also meet established and traditional building codes. However, at Flextegrity we believe that creative exploitation of the properties offered by improved materials is increasingly critical to design and engineering innovation. Given this technological and economic impetus, materials and the processes to shape them are now developing faster than at any time in history. And, the challenges and opportunities they present are greater than ever. Recent catastrophes on all continents point to the need for structural materials that will perform well under increasingly extreme stress conditions. Advanced materials must be anticipatory of emerging needs in their design, and offer comprehensive solutions to real-world problems. We have strong reasons to believe that our advanced icosahedral architectures can address a number of increasingly complex material requirements. Flextegrity is presently prosecuting two patents in the field of structural materials that address the opportunities presented in the fields of disaster-resistant housing and environmentally mandated geotextile solutions. Problem: Disaster-resistant housing. The changing global climate brings more frequent, severe, and disastrous weather events that overwhelm conventionally built structures. Present day housing construction is driven by a short-term cost mentality and traditional uses of materials. 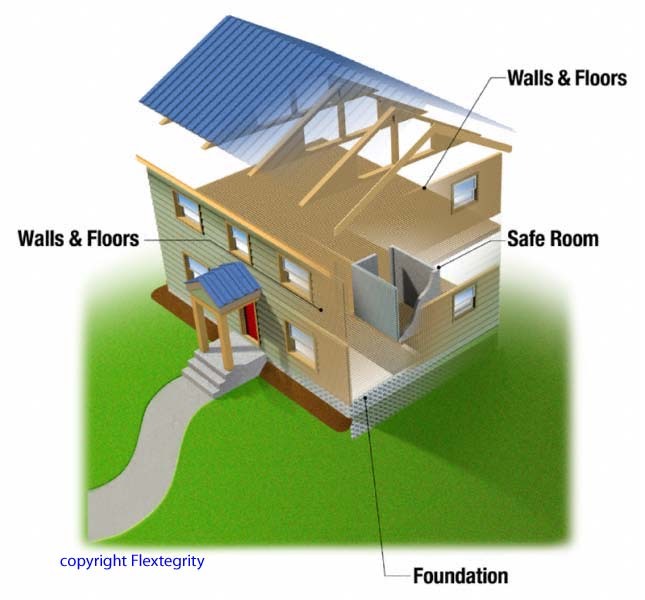 It is only as strong as its weakest connection such as the point where rafters join walls and exterior walls intersect, making the structures prone to damage from earthquake and wind damage. We continue to rely on the same materials and designs in hurricane-prone areas even though existing methods often fail to meet the overwhelming stress/force demands on structures. Yet building codes and property insurers’ regulations are becoming more rigorous as we speak. We need to re-think our designs and use of materials to anticipate catastrophic events and be resilient in extreme conditions. Solution: Comprehensive custom-engineered solutions leveraging the unique and robust properties of Flextegrity materials. Tough, continuous web-like assemblies for retrofitting existing foundations and walls could be factory-built to custom sizes and exact specifications. In new construction, the structure is designed as a “whole” where the rafters and walls are of the same integral construction to create unprecedented resilience against novel external forces. The diverse design potential of Flextegrity materials could allow for retrofitting and new construction of disaster-resistant structures without sacrificing traditional architecture’s look and feel. Problem: Environmentally damaging water run-off is increasing as we pave our suburbs. Simultaneously, water quality is decreasing as current water control methods channel run-off directly into streams and rivers. The more we pave, the less opportunity for water to percolate through the soil before reaching the aquifers and rivers that provide clean water for our cities. Sidewalks, as a familiar example, are relatively easy to apply but the material is impermeable, contributing to polluted run-off into our waterways. Paved surfaces present additional problems, as the material lacks any resilience and breaks under the pressure of a tree root. Successful repair is impossible—we are forced to jackhammer the problem, haul off the debris, and start over. Municipalities and contractors face an increasingly high bar of EPA-mandated stormwater control regulations, and are searching for versatile and effective solutions. Solution: Meet demand for EPA-required soil stabilization and stormwater control products that balance strength and durability needs with environmental requirements. 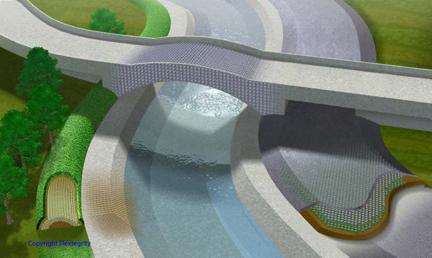 Flextegrity will produce structural 3-D “geotextiles” that are load-bearing yet permeable, allowing for the controlled drainage of stormwater and natural percolation/de-activation of petroleum-based pollutants,. The assembled array can flex under stress, and the component parts are easily dissembled and reassembled for maintenance. Designers will gain the ability to create natural forms that begin to look and behave more like the natural landscapes they replace. Soil stabilization fabrics, sidewalks and eventually, streets, can be constructed using strong materials that offer the benefits of permeability and ease of maintenance. Intelligent sensors, microelectronics and a variety of unique and responsive properties can be engineered into the material. Problem: Inflexible, heavy, non-integrated building materials. Age-old materials such as brick, steel, and wood don’t truly integrate with each other. They are abutted, bolted and otherwise coerced to coexist. Their inherent design forces us to build most structures using 90-degree angles. But we only need to spend more time outside to observe that biological systems (the most supremely efficient in the structure and use of raw materials) do not use Cartesian coordinates to grow and sustain life. Solution: FlexBlox, in initial development, will be the first flexible, permeable, structural material in the marketplace. Flextegrity’s geometry mimics natural structural efficiencies and can be integrated to form limitless iterations for landscaping, exterior and interior constructions, architectural motifs, and fencing. FlexBlox, a lightweight, flexible, easy-to-assemble material, will be equally appealing to the contractor and the home handyman.